Resin separation is key to condensate polishing system performance. Deionization plants operate at very high flow rates, making resin extraction a difficult proposition. Ovivo's CONESEP® technology is an internal distribution system designed to handle the very large ratio that exists between a high operating flow and the necessary resin regeneration flow. Using only two vessels, our system requires very little operator intervention, is easy to install and integrate well into existing plants. Condensate polishing is a specialized process and Ovivo has been designing and supplying this system for over 30 years. Our CONESEP® technology is widely renowned for offering the best performance in the market. We offer competitive solutions globally through our network of official licensees. 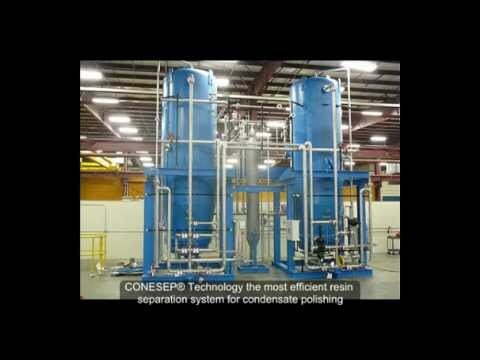 Based on our extensive experience of supplying condensate polishing systems, we have selected our proprietary Kennicott™ CONESEP® external regeneration plant for regeneration of mixed bed vessels. This system offers superior separation of cation and anion resins for mixed bed regeneration, giving excellent quality condensate with no risk of chemical contamination of the steam/condensate circuit and allowing for operation beyond the ammonia breakpoint. Fully automatic operation. The resin interface is detected automatically and resins separated without need for manual intervention. Most other systems require visual inspection and/or manual operation to perform a resin separation. Suspended solids removal without prefilters, with a specialized resin cleaning sequence designed to efficiently and effectively remove suspended solids retained by the resin. Separation achieved regardless of resin volumes, allowing for resin ratio to be adjusted without compromising performance. A very high degree of resin separation is achieved and guaranteed, minimizing sodium and sulphate leakage. Cation contamination of the anion resin is reduced to 500m. 99.9% removal of resin from both the service vessels and CONESEP® vessels. The Kennicott® CONESEP® module consists of two main vessels along with all the associated pipe work, valves, controls and instrumentation. The regeneration units are rubber-lined pressure vessels, each complete with a header and lateral distribution system for the regenerant chemical injection, which is located just above the resin bed. The resin is supported on an epoxy-bonded sand matrix in the anion unit, into which is set a collection/distribution lateral system. This matrix retains the resin while allowing flow of air or liquid. Its open nature will also allow removal of fine particulate matter by the combined air scour/rinse down technique. The cation regeneration unit features an optimized dished nozzle-plate design with little or no solids removal required within this vessel, while still allowing free flow of fluid. The resin is transferred from the mixed bed polisher unit via 80mm NB stainless steel pipe at a rate of 44 m3/h using demineralized water. Resin transfer is carried out hydraulically whereby the bed is roused and then directly displaced by water. Remaining resin is removed by pulsed sluicing. Initially mixed resin is received into the separation / anion regeneration unit. An optical resin detection switch is installed on resin transfer lines close to relevant vessels (service unit or regeneration vessel) to confirm that resin transfer has completed successfully. Air bump rinse out (ABRO) – the resin bed is first scoured with air to loosen any debris within the bed and loosen it up to ease the passage of rinse water through the resin. The air is then turned off and water is used to wash the debris (crud and any resin fines) from the bed, the flow being from top to bottom. The cleaning cycle can be repeated a number of times, the number being set by the operator based upon operator experience and the prevailing operating conditions. During start-up when crud load is high, it is usually necessary to increase the number of cleaning cycles. The air scour is followed by a full bed backwash and classification. This differs from the ABRO method in that the bed is washed in the opposite direction – water flows from bottom to top. The backwashing expands the resin bed to a level just below the top outlet strainer in the Separation/anion regeneration unit, grading the resin and allowing the denser cation resin to settle below the less dense anion resin. After initial expansion of the bed during backwashing, the fluidizing rate is reduced to allow full separation of cation and anion resins. The cation resin is then transferred to the cation regeneration unit by introducing transfer water into the base of the separation / anion regeneration unit. During transfer there is a small upward flow of water through the resin bed that is used to maintain a level cation / anion resin interface. The volume of water flowing upwards is equal to the true volume of resin leaving the unit via the resin outlet pipe. Important to the transfer procedure is the fact that ion exchange resins have an appreciable conductivity, which is utilized to detect the resin interface within the transfer pipe. A conductivity cell is mounted in the transfer pipe between the two vessels, which automatically detects the interface, thus allowing the CONESEP® system to operate without the use of expensive inert resin. To enhance the detection of the cation/anion interface, approximately 2 mg/l of acidity (as CaCO3) via gaseous carbon dioxide, is introduced into the resin transfer water. This acidity increases the conductivity of the water, and is taken up by the anion resin, thus lowering the conductivity. This drop in conductivity indicates the beginning of the interface of the cation / anion resins. As a secondary check, an optical device detects the change in resin color by measuring the increase in reflectivity as the anion resin replaces the cation resin. When the RIDDU detects the change in conductivity or reflectivity, the cation regeneration / mix and hold unit resin inlet valve is closed and any resin remaining in the transfer pipe is diverted to the interface isolation unit before the transfer sequence is halted. Following the transfer sequence, the transfer line is flushed to reduce the potential for resin cross-contamination with the majority of the resin being flushed into the resin interface isolation unit. The cation and anion resins are now substantially separated and ready to be individually regenerated. After separation the separated resins are ready for simultaneous regeneration. The first step in this process is to lower the water level to near the surface of the resin in both CONESEP® units. This is followed by the injection of 5% sodium hydroxide at 6 BV/h into the separation / anion regeneration unit and 5% sulphuric acid at 5 BV/h into the cation regeneration / mix and hold unit. Regenerant injection is followed by a displacement rinse. At this point in the regeneration sequence an optional cleaning step can be included to allow the individual cation and anion resins to be cleaned, if operating experience shows this to be of benefit. After regeneration of the anion resin a secondary separation is performed, which further reduces the cation resin held within the anion resin. A small volume of cation and anion interface resin is then transferred to the interface isolation unit. The resins are given individual displacement and fast rinses. On completion of resin rinsing, the anion and cation resin is hydraulically transferred to the cation regeneration / mix and hold unit. The unit is then partially dewatered and the resins mixed by air and further rinsed to ensure that no chemicals are transferred to the polisher units. The contents of the resin interface isolation unit are transferred to the separation / anion regeneration unit prior to the next regeneration sequence, and await the receipt of an exhausted resin charge from the polisher units for separation and regeneration. Importantly, crud loading on resin during the long service lengths of ammonia form operation is much higher, even with pre filtration, requiring good removal of crud during the regeneration procedure. The CONESEP® regeneration sequence includes an adjustable set point for ABRO repeats. These are a combined air-scour and backwash procedure, specially developed for the CONESEP® as an effective means of removing solids loading from resin with little effluent generated. Fine-tuning of the number of repeats of this step within the regeneration procedure allows for the system to be optimized quickly for ammonia form operation. Switching between hydrogen form operation and ammonia form may be achieved with the click of a single button on the HMI supplied, which will change all required software set points and control elements for immediate switch to control with ammonia form operation. Can Ovivo quote a condensate polishing plant in less than 2 weeks? 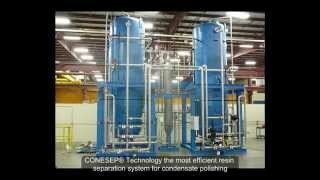 Where have you supplied condensate polishing plants with CONESEP systems? Which office do I contact to inquire about CONESEP and condensate polishing? The center of excellence for this product is the UK and they support Ovivo Singapore and Ovivo USA to offer our customers a ‘local’ solution for Europe, Americas and SE Asia. Which customers have CONESEP systems? Alstom, Siemens, Mitsubishi Heavy Industries and Doosan are some of the international EPC contractors that have purchased CONESEP systems from Ovivo.